Today for your approval I bring you the life and times of the mariner Edward Barlow. Barlow is not some hero you read about today in textbooks or novels. Barlow is a very real person who served his entire life aboard English ships and the reason his life is so exceptional is that he seems to be one of those characters of fiction that just happened to be there to witness so many pivotal moments in history. So for those who agree with me that literacy was wider spread than usually thought, Barlow is an excellent example of someone from the working class who is quite literate. For those that believe otherwise, Barlow is an extraordinary exception. 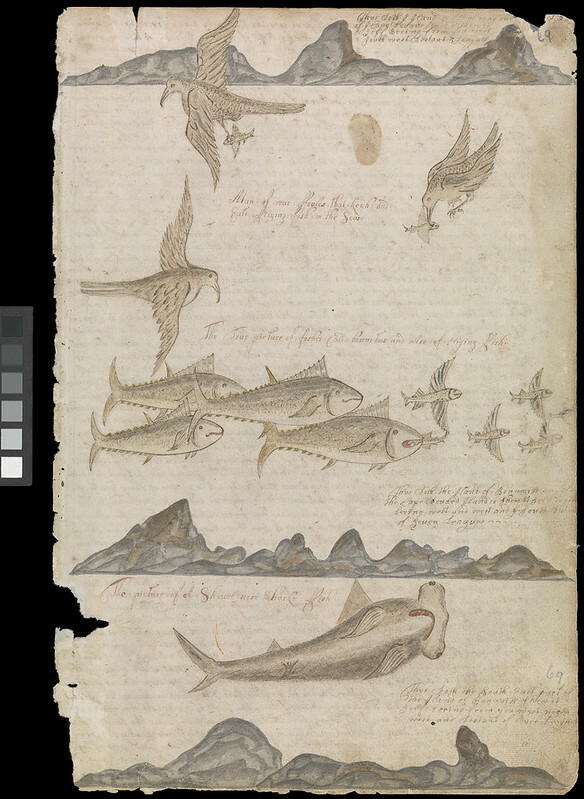 Regardless, Barlow is so very important to us now because he was not only literate, but quite a decent artist as well – attributes which allowed him to produce the only known complete illustrated journal of a 17th century mariner’s life which has survived until modern times and is carefully preserved at the National Maritime Museum in Greenwich. This journal is quite simply an amazing source of knowledge for historians. It is a window into the past brought to us by someone who was really there and shares with us his thoughts on the life and plight of the average English seaman of the day. From life aboard ship, the food, sickness, pay, the rule of law, routines, officers, corruption, storms, and war, Barlow gives us an insiders view of it all. His illustrations give us amazing contemporary views into the many ports of call around the world that he visited. He shows us the appearances of these places, the different ships that were anchored there and all manner of living creatures. 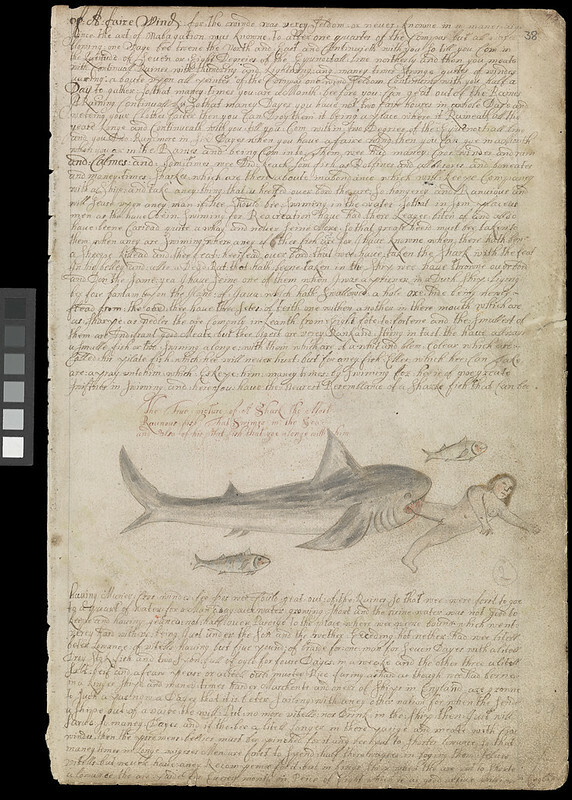 NOTE: I present to you copies from the NMC of the available illustrations of his journal. Normally I would have just linked to the images on their website, but they have a clunky little window that doesn’t allow one to view the entire image zoomed in at one time. 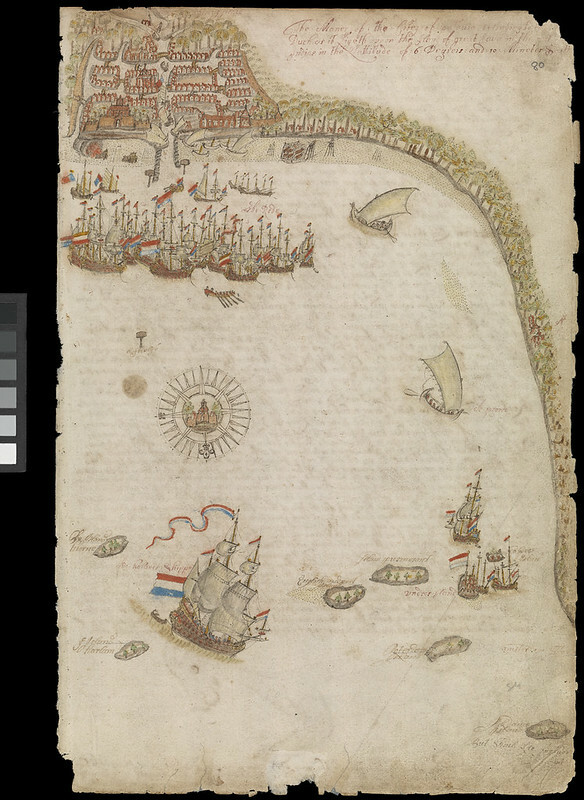 When you look at these images, notice the huge amount of Dutch ships which were encountered in these many ports. This completely backs up the scholarship making the case that the Dutch possessed a great majority of the worlds ships and that they were everywhere trade was to be had (even English ports during peacetime). Also take note of the flags that the ships are flying. Warships and merchantmen can be distinguished from one another through flags alone. 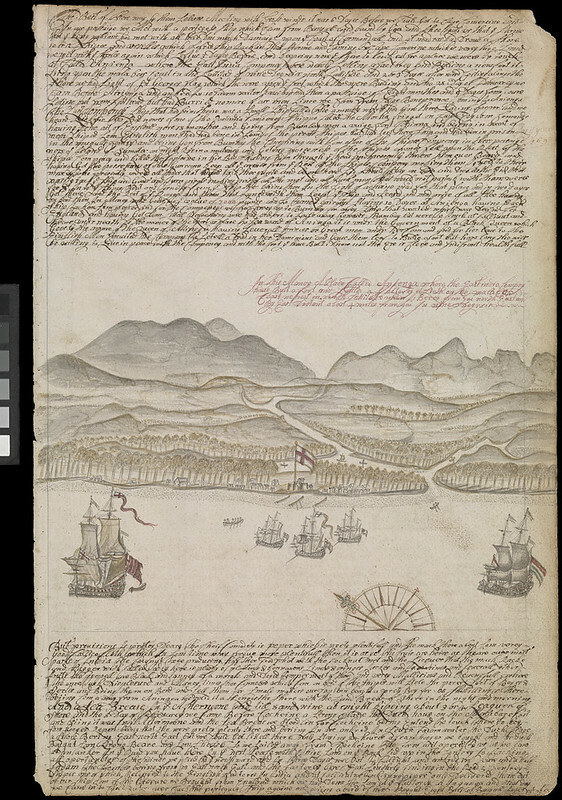 Also important in this visual record are ships colors and decoration. 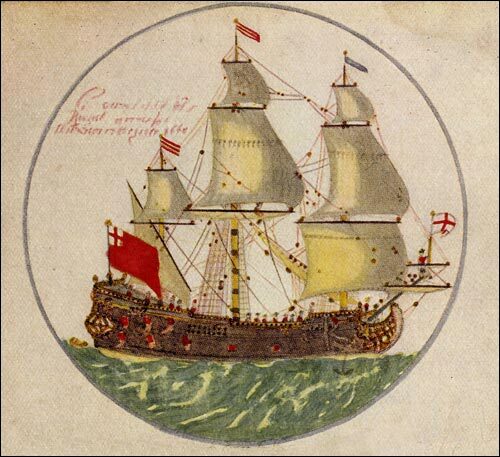 Barlow’s illustrations show us clearly that ships were both gilded and painted. The only book ever printed which documented Barlow’s life and compiled his hand written work into text accompanied by his illustrations and other commentary was printed in 1934 and is sadly now long out of print. This two volume set compiled by Basil Lubbock can sometimes be found in auctions. One went for as low as $374.00 just this last March. Too bad I missed out because I find that I must have a complete copy to complete some of the research for a couple of my own books. Many book sellers have copies but they average anywhere from $600.00 to $800.00 a copy. So I myself just took the plunge and bought a copy from one of these book sellers. I got the silly notion that with as many readers as we have here at Buccaneer’s Reef (at least 400 consistently read my articles), all remaining available copies will quickly be bought up after I publish this article. 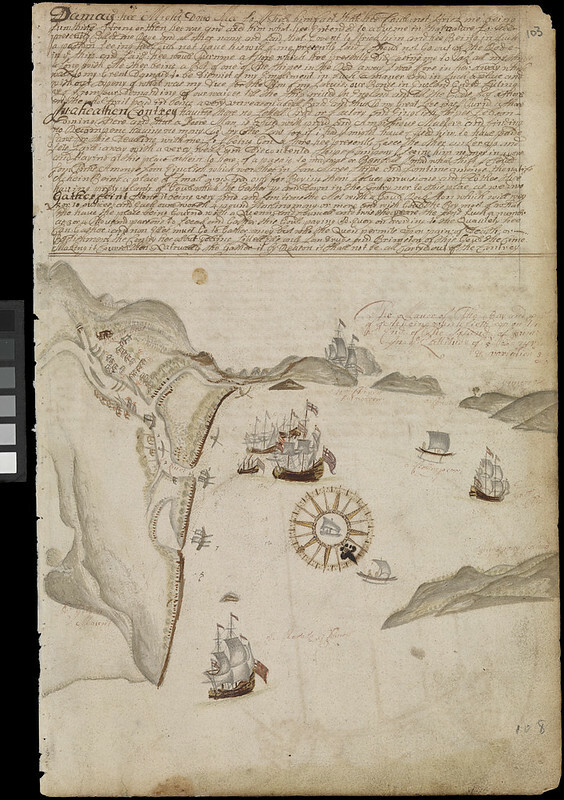 The work is entitled Barlow’s journal of his life at sea in king’s ships: East & West Indiamen & other merchantmen from 1659 to 1703. The title says it all and Barlow spent most of his life (serving over four decades) at sea and served on many ships. He even gives an account of which ships and whose ships were better than others – having an opinion that naval service was preferable over merchant service which is surprising to us now from the common view popular culture and the media paints of hardships in navy service. However Barlow makes the case that better food, better and more consistently reliable pay, better working conditions, better clothes which lasted longer, no deductions from pay for damaged cargo, easier work, and pensions for injuries – all considered, made service on King’s ship preferable to service on merchantmen. 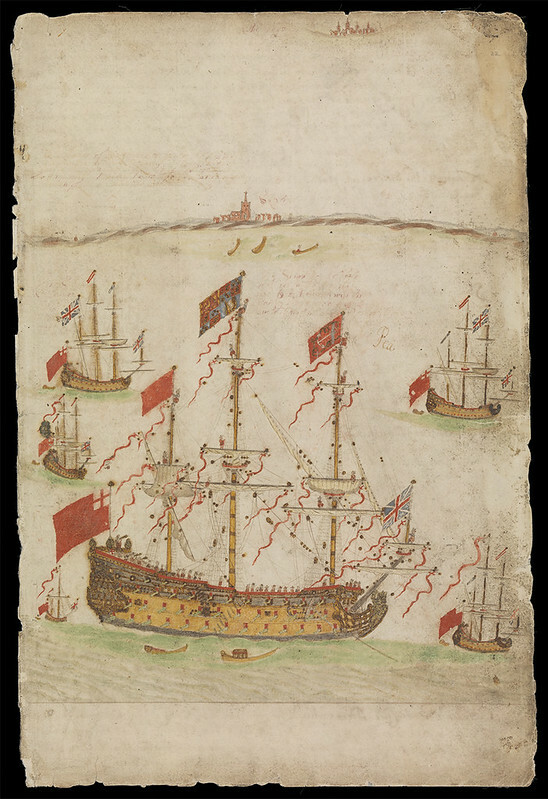 Despite this, it seems Barlow spent more time aboard merchantmen than in the King’s service. From a good look at the journal I believe this is because even though service was better aboard naval ships, Barlow’s experience over time allowed him better positions and opportunities aboard merchant vessels. Barlow was not a naval officer and had not passed any examinations, however decades into his career in merchant service we know that he enjoyed the rank of “First Mate” aboard the English East India Company ship Scepter. In addition, I believe that in these positions Barlow learned every skill of seamanship. Many of his illustrations of ports list navigational information on exact position as well as illustrate numerous depth sounding numbers in various places about the ports. He also sometimes includes a compass rose with the directions indicated in orientation of the port illustration. Barlow was born at Prestwich, Manchester, England, on 6 March 1642 (one of six children) of George Barlow (c.1599-c.1686), husbandman, and his wife, Ann (d. 1692). Barlow began an apprenticeship as a bleacher of cloth and linens known in that time as a “whitester”. This was not to his liking and seeking a better and less mundane career, Barlow left his home at age 15 in 1657 traveling to London to stay with an uncle there and seek better fortune. 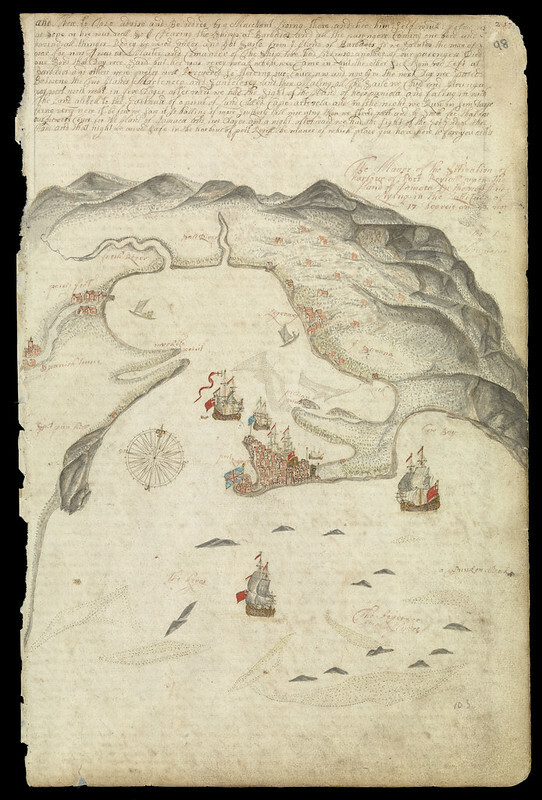 Barlow was not pressed and the call of sea and ships caused him to voluntarily sign on in 1659. While not being pressed, Barlow is however very opinionated on the practice of pressing men into service. He seems especially disdainful of pressing men that already belong to other ships who in the process can lose everything they have. He states that impressment, “…is a very evil custom amongst our English one with another…” and that “His Majesties ships taking pains to press poor men, but do not take care to see that they have their right which is due”. He goes on to say that the press gangs “will not believe a poor man when he tells them he belongs to another ship unless the man whereto he belongs be in sight” and further states that being pressed “causeth many a poor man to lose his chest and his cloths and several months pay…”. More feared than the press gangs however were pirates. Barlow served with a Mediterranean patrol whose orders were to combat piracy and protect English shipping from the Dutch and Barbary pirates in 1661-62. This particular brand of pirate saw captured sailors and passengers as as much of a valuable commodity as any cargo and would routinely sell captured Europeans into slavery. 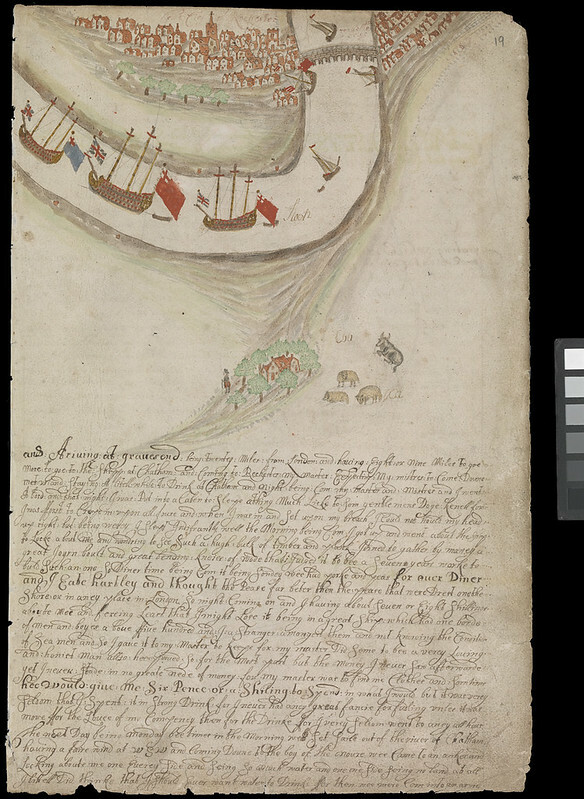 Barlow writes during this expedition, “This week a ship arrived in the river in 5 weeks from Barcelona, and brings an account, that the Sallee Rovers (Pirate Republic of Sale (1627-68) in modern Morocco) have taken an English ship … and carryd her into Salle (Sale), and the men (taken) up into the country into slavery…”. He goes on to say that the ship bringing the news barely escaped the pirates themselves. And speaking of Pirates… on the other side of the Atlantic in the Caribbean, Barlow illustrates one of the best contemporary renditions of Port Royal, Jamaica I have ever seen. In May of 1660, Barlow, an apprentice seamen on his second voyage, crosses paths with great men of history. With duty aboard the massive man of war (flagship) Naseby (soon to be rechristened the HMS Royal Charles), Barlow shares the deck with none other than Samuel Pepys. Pepys and Barlow couldn’t be more different coming from two completely opposite socioeconomic backgrounds/classes. However, both men are now famous for their journals, and both men actually agreed on a great many things. Both men complained of the corruption in the navy, the pay problems, and the foppish gentlemen officers who obtained their commissions through nepotism or gaining favor from great men, but were no seamen. Though neither man probably even spoke with one another, both men cared deeply about the English Navy at a time it was in great evolutionary development (growing pains). Both must have been excited as they voyaged to Holland to bring in the first chapter of the Restoration. With the monarchy restored after 11 years of Cromwell, Charles II rode aboard the flagship home to England once again after a long exile. None of these three men could imagine that the great ship they stood upon would be captured by the Dutch only seven years later during Britain’s most ignominious defeat and towed back to Amsterdam a prize of war and broken up for timber. Indeed Barlow encountered the Dutch many times throughout his career and even served with them. His anecdotes show no malice for them even though its clear there were some dangerous encounters. 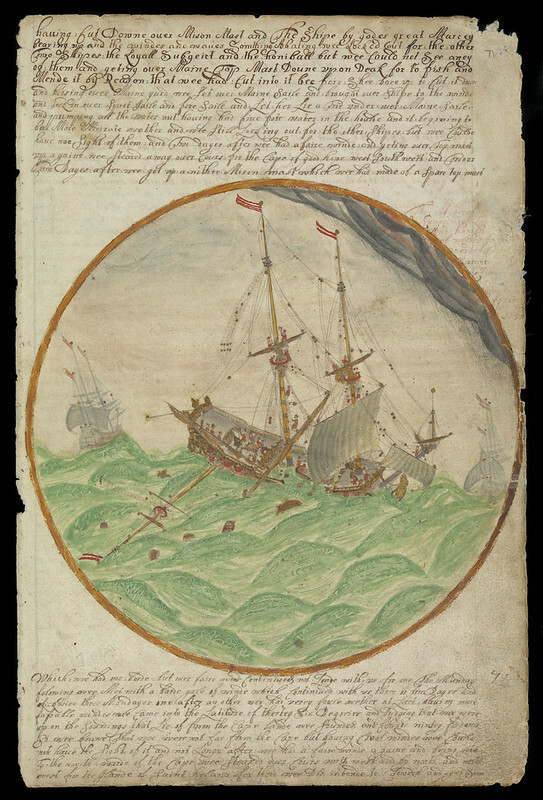 Take note of the illustration below with his ship striking its colors to an overwhelming Dutch force in the Sumatra strait. 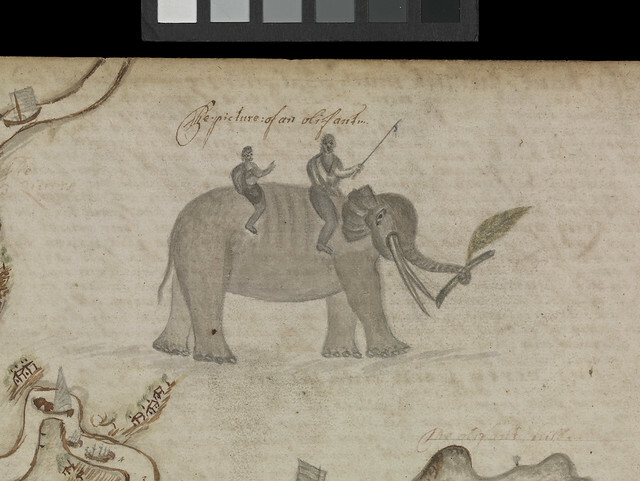 Also while serving in India, Barlow encounters elephants and illustrates the animal quite well. Well from this commentary we know the stories we’ve heard about bad rations on ships to be very true. In my nearly finished book I have an entire chapter dedicated to victuals and supply. Each nation had different practices. Some relied much more on fish. Others like the Dutch would put cheeses aboard. Often a Dutch seamen was issued a large wax encased cheese that would keep for a year or two and he needed to make it last for months before he was given another. If he gambled it away or finished it before the appointed time, he would starve or rely on others. This was a punishable offense – and Dutch punishments made the English ones look kindly. Anyone caught stealing another man’s rations would have his hand nailed to the mainmast and left there for several days before they forcefully pulled the hand from around the nail causing an even larger wound. Its fascinating that these thieves were often the result of gambling away their rations. 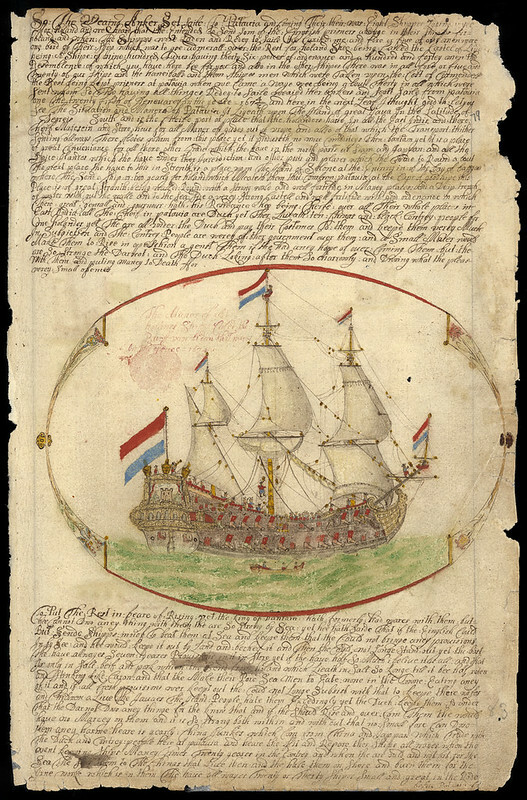 Of course on English ships gambling was not allowed as I detail in my story on Piet Heyn. According to my original research this was because the King had passed the law centuries before, for the reasons of desiring soldiers to drill in archery rather than loiter and gamble. I believe the practice remained in place long after the longbow was obsolete to prevent the very problems the Dutch experienced with thieves. Speaking of thieves and corruption, Barlow complains bitterly of losing wages to ship owners who would unfairly deduct pay for damaged goods from sailor’s salaries. He tells us that when the time came to pay the crew that, “our commander said the owners of the ship would stop 3 pounds from every man out of his wages for goods that had been damnified and spoilt in the ship.” The crew is blamed, “for not storying (storing) them better and not taking care enough of them.” Barlow has every reason for being unhappy. I’m surprised the crew didn’t mutiny. Three pounds at that time equated to three or four months wages for the average seaman! Imagine losing a quarter to a third of your annual income/salary. YIKES!!! There is just so much to be learned in a detailed study of this document! It’s very difficult looking at all of these wonderful illustrations to pick out my favorite. I don’t know that I can confine it to just one. 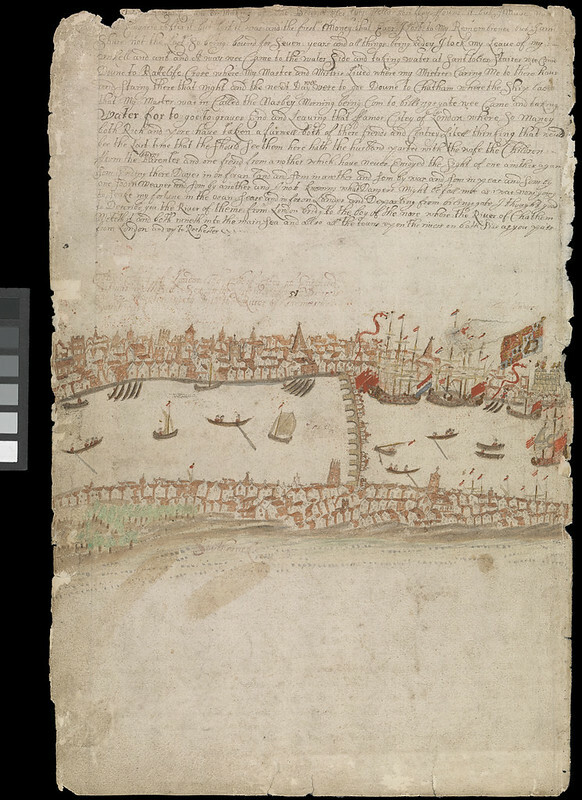 I love Barlow’s illustrations of his ships back in England, at Deptford and Greenwich on the Medway and his drawing of London and all of the ships there – large and small – in the foreground of the Thames is simply incredible! 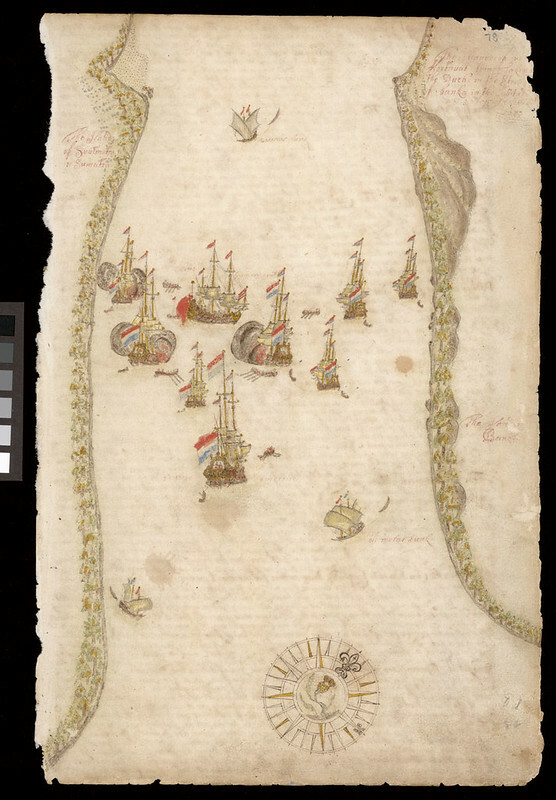 I love the illustration of Dutch Batavia. This was one of the most bustling ports of the East Indies. 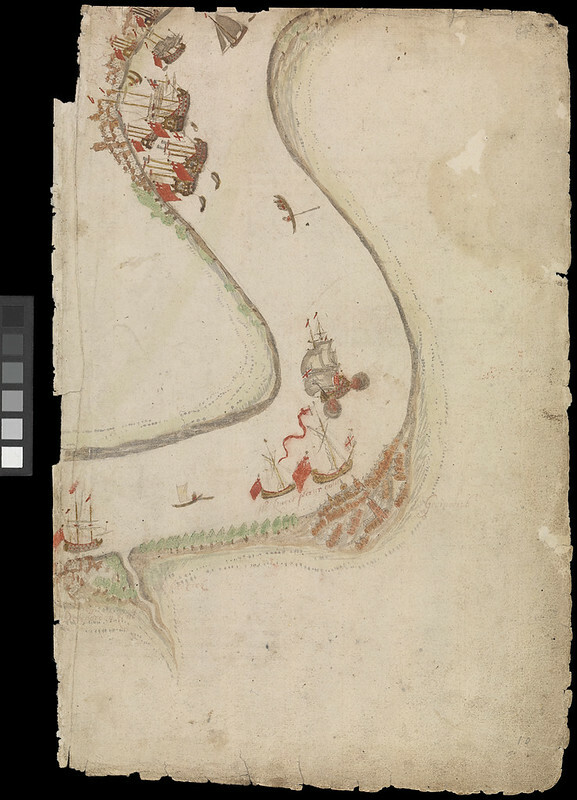 Look at all of the little eastern trading ships – prahas, dhows, and Chinese junks. Wouldn’t it have been incredible to have seen it in person! I also love the illustration of Cape Town. For half of its history it was Kaapstad and was a Dutch colony until the late Napoleonic era when it was ceded to Britain. Here we see the port full of Dutch ships. 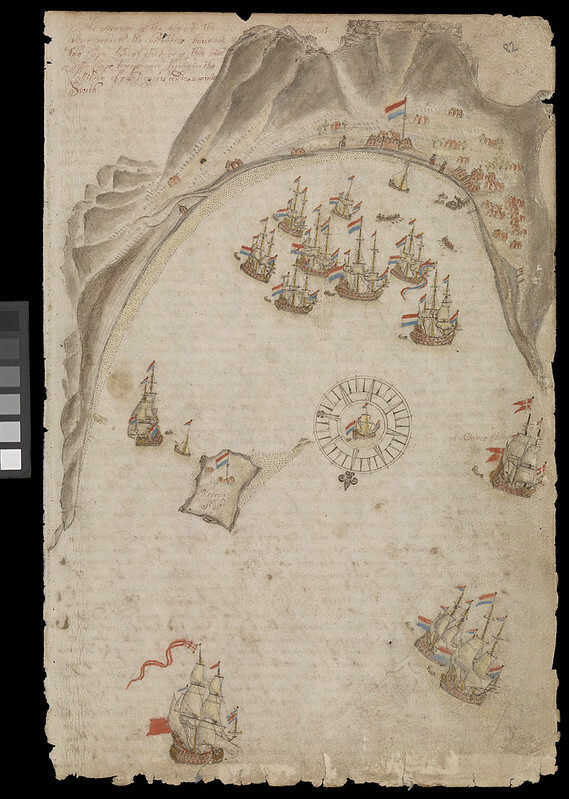 In the lower center we see an English ship and to the right we see a Danish ship. One can clearly make out the known great landmark of Table Mountain above the port which caused the bay to be named Table Bay. Later in 1671 off of this same place Barlow experienced a tempest as his ship the Experiment is blown helplessly shown losing its mizzen mast. Above the illustration is a poem or balled in which Barlow attempts a dramatic description of the ordeal. I will most definitely write more about this once I have digested the entire journal in detail. So look for there to be a Part 2 to this article in the future. I leave you now with a lovely illustration of a large Dutch ship Barlow has drawn. Simply an amazing career and an amazing historical document. I am tickled to death to have brought it to you. If you enjoyed my commentary and these illustrations, look at the whole set I’ve uploaded to my FLICKR site HERE or see the NMC LINK here for the origin source of these illustrations.